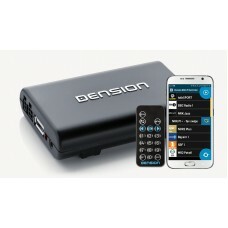 The perfect solution for a non-DAB/Bluetooth car radio, the Dension DAB+M. Giving you an exceptional user experience with its simple and intuitive display, the DAB station’s information and the menu on your RDS capable FM-radio. NOTE: If you would like to connect the DAB+M to the cig socket to power the unit and not have it hardwired into your car, please select from the recommended add ons at the top of the pag. The DAB+M receives the DAB broadcast through a DAB antenna (not included in the package, you can purchase this in the add ons above) and connects to the radio through an FM-transmitter (frequency range adjustable: 87.6 MHz ~ 107.9 MHz) or AUX. So you will be able to listen to DAB broadcast through your existing radio. Dension DAB+M needs to operate with an RDS car radio in order to properly display the relevant system message from Dension DAB+M via the in-car radio display.